I got an email about a month ago from a gentleman who complimented me very nicely on my frames and then informed me that according to his friend, all my dropouts were going to break... He explained that his friend had seen dropouts from another well-known builder break, and since my dropouts bear some vague aesthetic similarity to them, mine must be doomed to the same fate. Well, this got me thinking, I don't have any doubts in the strength of my Ellis dropouts, I work with them every day, but how could I explain how mine are different than the (dozens?) or other poorly designed or assembled dropouts that exist in the frame building world and that might break at some point down the road? The first set of Ellis dropouts. First, let me say that in my 14 years or so of building frames at Serotta, Waterford, and now Ellis, I've seen my share of broken dropouts. I'd say that 75% of those were the result of just one thing; folks flexing their frame open to fit a wider spaced wheel. I know what you think; it's just a few mm's, what's the difference? When the stays get flexed open, two things happen, firstly, there's a built in "tension" that the rear end parts are constantly under, and the dropout faces are no longer parallel with each other. Then you clamp your wheel in and the dropouts flex just slightly back to parallel now that they are under the tension of the quick release, all is well, right? Well, not really, now as you're out riding, the frame has this built in tension that it's trying to relieve. You hit a pothole, ride over some nasty chip seal, and all the while it's slowly working on a way to relieve this stress. What eventually happens is this, either the chain stay breaks just in front of the drive side dropout, or the dropout tab breaks, and the tension is relieved! So, that takes care of roughly 75% of the dropout breakage, how about the other 25%? I would guess that a good chunk of these happen because the dropout faces of the frame are never properly aligned when the frame is built, essentially following the same scenario I describe above. The rest of the breakage is probably due to poor brazing, crashes, dropout design, and finally a tiny percentage to corrosion. OK, so if we agree that dropout alignment is key to their longevity, how do I make sure that my Ellis dropouts are aligned? Well, it's a struggle, because my dropouts are cut from 17/4 stainless steel, they are incredibly tough, and hard to bend. I need to check and re-check their alignment throughout the build process to make sure they are straight and stay that way. To start, I pre-bend the dropout tabs in a vise and dry fit all the dropouts and chain stays in the fixture before any heat even touches them. Once I've brazed the dropouts into the chain stays, I recheck again on the fixture to make sure everything is still lined up. The dropouts get checked once again after the frame is brazed and aligned, and then a final time right before the frame heads off to paint. I can't speak for other builders and their procedures, but I'm confident that when you receive your Ellis, the dropouts will be straight and stay that way for a long, long time! The finished product, elegant and strong! 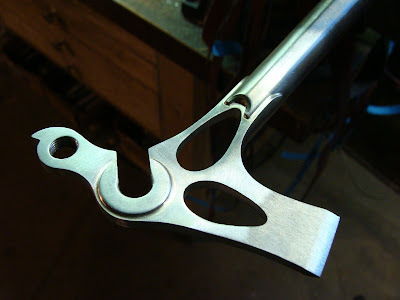 I'll post more soon about why Ellis dropouts are shaped this way, and some other cool features I've designed into them. Very interesting. I must say that I am surprised that this would top someone's concerns about a frame. I am not a frame builder, but I worked in a bike shop for quite a few years during the steel era (hmm, I sound a bit like "not a doctor but play one on tv.") Most of the stress breakage I remember was around the bottom bracket. But I am not doubting you one iota - quite the opposite. Just saying that I've always thought of the dropouts as the strongest part of the mix, and that by spreading the rear spacing, one was more likely to damage the brake or chain stay bridges or kink a seat or chain stay. So like I said, interesting. I might sound dumb, but do you think the dropouts you designed are also less subject to stress because of having less material (ie they have "windows" that for example a Ritchey doesn't have)? Hey gobucky, there are no dumb questions! I don't know if you're right, but I think the interesting thing is that my dropouts probably have almost as much metal as the Ritchey's, it's just looks less substantial since they have the large windows on each tab. If the material were compressed, my dropouts would easily have more metal than many "stock" dropouts out there, and the 17/4 stainless is much stronger than the cast steel that most dropouts use. Great post, Dave. 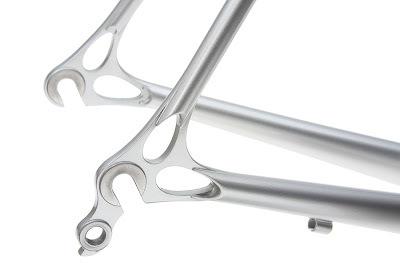 I wonder if Surly has had any problems with their Cross Checks being spaced at 132.5mm? It's only +/-2.5mm, but they guaranteed every hub would be the wrong size. Joel, it's funny that you mention that split spacing configuration, originally a Rivendell idea, (I think), because I occasionally get a customer who thinks they'd like this. For obvious reasons, I really don't like this setup, and most folks put one wheel in the bike and never change, so you just have a frame that never fits your wheel right, and that's guaranteed! I wish I'd read this before I purchased my second Surly Cross Check frame. Although, I have to say I put the first one to a real test. 20,000 miles, mostly fixed wheel, in hilly Duluth. I hit thousands of potholes and bumps on our rough local streets and never broke a dropout. Lots of slow grinds out of the saddle up Duluth's hills. Maybe I was just lucky. As I look back over the years I have designed a good number of dropouts for several companies. Along the way I made some mistakes, and when you make a mistake on dropouts they do break. I am not going into the details of dropout design but I do not see any of the mistakes I made in these dropouts. They are beautiful and well designed. Keep up the good work!